Good quality sleep has major implications on health. A quality night’s sleep not only makes us happier when awake in the morning, but it also makes us more energy when on the move during the day. Conversely, poor sleep quality can be very detrimental to health. Trouble sleeping or insomnia is one of the causes of poor quality of sleep. The good news however, insomnia can be improved by improving nutrition and food intake. By increasing the consumption of vegetables, fruits, and herbs, the quality of sleep can be helped to the better. The following are the types of foods recommended by health experts to help relieve insomnia and improve sleep quality for the better. This fruit contains a lot of melatonin, which helps relieve insomnia. In the body, the hormone melatonin helps regulate hours of sleep and energy cycles. Melatonin deficiency causes a person to feel tired, and could not sleep well at night. Cherry can be consumed in the form of raw fruit, juice, or mix it in cake. 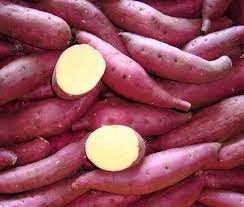 In addition contains a lot of protein complexes, sweet potatoes also contain potassium which helps improve the quality of sleep. Potassium helps muscles relax and induce sleep more healthy. Worthy of note, most of the nutrients are in the skin so that the potato skin and flesh eating yams will complete nutrition that the body is received. Regular consumption each day will improve the quality of sleep. Bananas contain a lot of natural elements made ​​from potassium for muscle relaxation. Bananas are also rich in vitamin B6, which is a constituent of melatonin. Melatonin will increase slowly treat insomnia. Kale is a dark green leafy vegetables are rich in calcium. A study said that people who lack sleep are also deficient in calcium in the body. Kale consumption may help increase calcium, which then have a positive impact on improving sleep patterns. In Indonesia known as edamame soybeans Japan, and can be consumed in a state of fresh, frozen, or as a snack. Edamame is a source of carbohydrates, protein, fiber and some vitamins. Research shows, edamame reduce symptoms of lack of sleep menopause for women. Edamame contains components similar to estrogen, which prevents heartburn at night can disrupt sleep. This herb has long been used to help variety of health problems, ranging from stomach complaints to less sleep. Widely recognized as a product of health tea, chamomile also can now be found in the shape of extracts and ointments applied to the skin surface. As a kind of tea, chamomile can help the body to be more relaxed. Clinical research on the benefits of this herb in improving the quality of sleep in humans is still limited. But animal testing has provided positive results. This herb is found in the form of supplements. For thousands of years, valerian is used to treat symptoms of anxiety and insomnia. Worthy of note, there has been no scientific studies that prove the efficacy of herbal success to treat insomnia. However, many are experiencing sleeplessness complaints using valerian as a supplement every day. Be sure to always consult a physician before using any medications or herbal supplements. Produced by the pineal gland in the brain, melatonin is a hormone essential in charge of regulating the activity of sleep. When a person is deficient in this hormone in the body, then he will experience insomnia and lack of energy. Melatonin is now available form of food / natural supplements to help improve sleep. The melatonin supplements have not been thoroughly tested scientifically therefore important to consult a physician before using this product.